Celestine "Ceelie" Savoie left Louisiana as soon as she could, heading to Nashville to seek a career as a singer/songwriter. Unfortunately, that hasn't exactly gone as she'd hoped. She's unemployed, broke, and about to be homeless when she receives word that her great-aunt has been murdered and Ceelie is her only living relative. Whiskey Bayou is one place she thought she'd never see again but, once there, she begins to remember how much she loved spending time there as a child and the lessons she learned at Eva Savoie's knee. Life on the Bayou begins to cast its spell over her once again but someone wants her out of Eva's cabin and it appears that person will go to any lengths to make it happen...even murder. Gentry Broussard is one of the good guys. He lives on the right side of the law which, unfortunately, put him in the position of having to make a split decision that tore his family apart. It haunts him still. He discovers Eva's body but, as a Wildlife officer, isn't officially attached to the case. However, what he witnesses at the scene has him wondering if he's seen a ghost and when Ceelie is threatened, he can't stay away. The more time they spend together, the closer they grow but Gentry is a man whose entire life in on the Bayou, Ceelie is a woman who only wanted to escape, and somewhere out there another person lurks who wants to see both of them dead. Wild Man's Curse is the first book by Susannah Sandlin that I've read. I'm here to tell you, it will not be the last. Wow, what a ride! 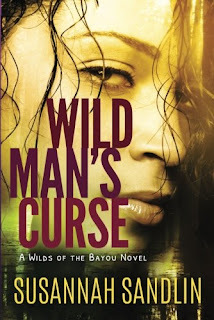 I wanted to read it slowly, savoring each word; absorbing the steamy, mystical, sometimes sensual, sometimes sinister life on the Bayou while at the same time, racing through the pages to discover what awaited around the next turn. Sandlin paints a vivid picture of life on the Bayou and the people who call it home. I could feel the cloying heat and humidity, hear the lapping of the water, the buzzing of insects, and the soft whir of trolling motors as the good guys - and the bad - navigate the waterways. She brings her characters to life as well; developing them with a deft hand and allowing readers to come to know them gradually, as one would in real life. Sexual tension sizzles between Gentry and Ceelie but the romance develops slowly, realistically, in a believable and emotional way that I enjoyed and appreciated. The secondary characters are also well developed, actively contributing to the story and setting the stage for future books in the series. And the villain? Well, let's just say I did not sleep easily after turning the final page of this book long after my bedtime. I highly recommend Susannah Sandlin's Wild Man's Curse and am anticipating future books in this series with great enthusiasm. I've already pre-ordered the next book, Black Diamond, scheduled for an October 2016 release. Tell me about the last book that kept you up long past your bedtime. I love books like this. Like you, I race through needing to know what happens. These are the ones that require a second read, at the least. I can then slow down and enjoy the writing, the characters, the way the plot unfolds. You get so much more of the story from those additional reads. You're so right, librarypat. I've already read it a second time just for that reason. I think Wild Man's Curse is just wonderful. Could not put it down. Buy the book, you will have a fun ride. Thanks for stopping by! I agree. Could not put it down! This book would be enthralling. A novel which I could not put down was Daniel Silva's The English Spy. Rebecca was and still is the book I could not stop reading. Thanks for the review and giveaway--sounds great. Harlan Coben's Fool Me Once was the most recent book that kept me reading into the wee hours. Let's see...HOT IN HELLCAT CANYON kept me up way late and I was doing the: "just one more page...one more chapter" until I was like, "You have to work tomorrow, idiot." But I *did* turn off my TV last night so I could read uninterrupted on MAGNATE and finished that last night. Now I've started MRS. WINTERBORNE and I know I have a LONG night ahead of me! The last book that kept me up was Seized by Kaylea Cross. I was turning the page and afraid of what was coming next. Loved the book. The last book to keep me up was J. T. Ellison's No One Knows. The twists and turns in that book were fantastic. Most of them do lol. I always do the "just one more chapter" and some chapters can be mighty long lol.